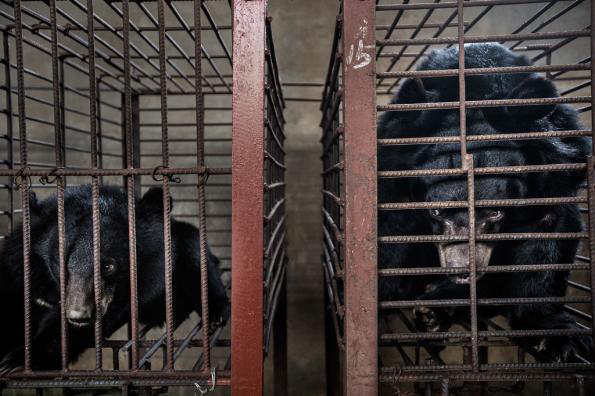 Bears kept in cages for bile production and extraction in Mong La, Burma. Photo by Minzayar Oo. Like tigers, bears have a strong influence in the traditions and histories of several nations including Russia, China, Korea, and are also featured in Hinduism. In the past some of the indigenous peoples in what is today eastern Russia and northern Japan had creation myths relating to bears and even worshiped them as a higher power. This strong cultural heritage relating to bears has allowed a renewed or continued interest in bears in Asian countries. Asia is home to several species of bears but it is the Asian black bear (Ursus thibetanus), Sun bear (Helarctos malayanus), and brown bear (Ursus arctos) species that are most commonly killed for their meat, particularly for their paws which are considered a delicacy in some Asian cultures. The Asian black bear and Sun bear are frequently taken from the wild, while some farms claim to have bred the bears, and have their bile extracted. The combination of these motivators in addition to habitat destruction due to logging or to increase farm land has led to a significant decline in all bear species populations throughout Asia. In China there are thought to be more than 10,000 kept on bile farms while other estimates place that number closer to 20,000. There are an estimated 2,400 bears on bile farms in Vietnam. 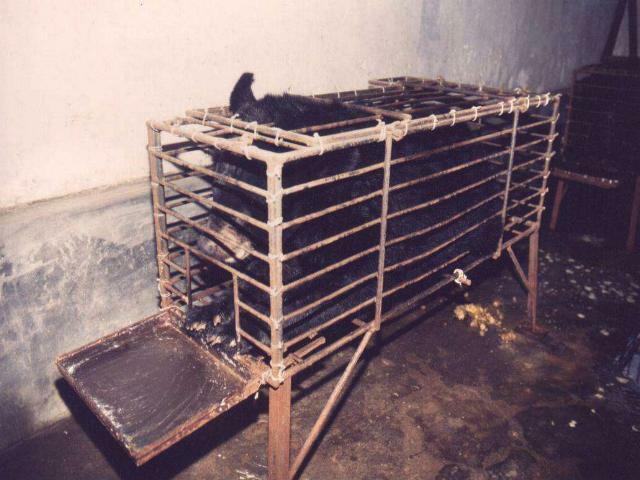 Laos, Burma, as well as Korea are also known to have bear bile farms. 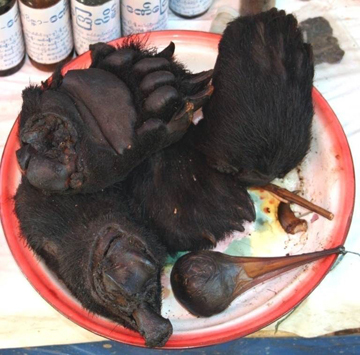 According to TRAFFIC bear bile-based products are readily available in a number of countries throughout Asia (page 20), and are regulated but not illegal in Japan and China, with many of the products making their way to Southeast Asia being smuggled from China. Bear bile comes from the liver, but is stored in the gallbladder and is typically collected from bears who live in captive commercial farming operations. These bears are typically surgically fitted with a catheter (warning, graphic) or tube to drain bile and produce a small amount of usable product. 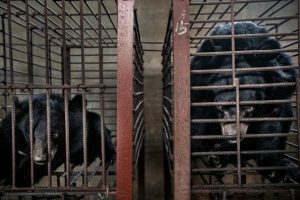 While some bear bile farms have claimed to have an active breeding program to maintain domestic populations farm employees have admitted that bears are frequently and illegally taken from the wild. Traditional Asian folklore suggests that bile and gallbladders from bears have medicinal value in treating a variety of physical conditions ranging from sore throats and hemorrhoids to liver problems. Bile sold for medicinal purposes can come in the form of liquid, pill capsules, lozenges, topical ointments, flakes, or as fresh gallbladders which may be taken from small bears or cubs. There is no solid evidence that bear bile has medicinal benefits, although it is possible. However bile sold in most Asian countries may be more expensive than synthetic medicines that are known to be effective remedies. There are also legal, herbal alternatives to bear bile that are sold and do not feature animal parts as part of their remedy. Due to the generally poor conditions of their captivity the health and life expectancy of the bear is considerably reduced, however bears can be kept for more than a decade in these conditions. Conditions are so poor, and the bears so frequently in pain, that some are allegedly fitted with vests to prevent them from harming themselves out of desperation. Bears can become malnourished and without adequate living conditions to prevent severe illness have been recorded showing severe psychological stress and physical health problems. In one instance reported by an Asian news source a mother bear escaped its cage and killed its cub before killing herself, however bear behavior experts suggest this report might have been fabricated. After several years of living in these conditions bears may not be able to produce adequate supplies of bile and are then killed. Their paws and meat are then sold as delicacies (warning: graphic images). Note: The bear shown on the right has since been removed from captivity and is living at a bear sanctuary in China operated by wildlife conservationists. Bear paws and what might be a gallbladder. Photo by TRAFFIC. Bear paw is traditional delicacy dating back more than 3,000 years in Chinese culture, but has also featured prominently in some 17th century European cuisines. Today bear paws from adults and even cubs are sourced from all over Asia to support demand within the Asian market which creates a variety of dishes out of bear paws including soup. In Laos bear paw whiskey is a traditional, although expensive, delicacy. Over the last couple decades bear paw has had a tremendous resurgence in popularity as restaurants seek to create historical-inspired dishes for wealthy individuals and businessmen visiting Macau and throughout affluent parts of China and Southeast Asia. In 2010 two trucks carrying 447 bear paws were stopped at the Russia-China border and their cargoes were confiscated. The bear paws were worth $50 per kilogram in Russia, but would be sold for much more in China. Trafficking of bear meat was reportedly common in that area, with both legal and illegal bear hunting providing meat, gallbladders, and paws to keen consumers. Recent arrests (page 25) in Russia and China suggest that trafficking of bear parts in southeastern Russian and northeastern China is a continuing problem in 2014 and a group smuggling 213 bear paws into China were arrested and sentenced to at least five years in prison, with two of the members also receiving fines of ¥300,000 ($48,600). During Operation Taring II (2015) wildlife enforcement agents in Malaysia seized multiple juvenile sun bears, including a month-old cub advertised on Facebook, destined for illegal trade. Bear trafficking is also common in Southeast Asia where bears are farmed for their bile and paws are a profitable byproduct of bears that die in captivity or are too sick to be drained.